Life With 4 Boys: Monday Mojo - Why Am I Named Kathleen? Monday Mojo - Why Am I Named Kathleen? This week's Monday Mojo topic is all about names. Your name that is. How did you get it, what does it mean etc. Maybe this is the place where I pop up and tell you that Kathleen is not my real name and I was really born Malificent. Okay, maybe not, but it sure would have been a lot cooler than Kathleen. My dad actually gave me my name and although I do have a far distant aunt who shared the same name, I was not given it because of her. 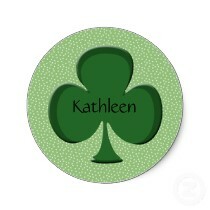 Kathleen is a name of Irish origin and is a variation of the Greek name Kathrine, although don't ever let my mom catch you calling me anything other than Kathleen. I was never allowed to abbreviate my name and now I can't stand be called any other variations of it. The name means "Pure" LOL. Not so sure I can completely live up to that, but at least it doesn't mean "swims in tar" or something. My mom and dad had a deal that if I was a boy she would name me and if I was a girl he would get to pick the name. Needless to say, my dad won and I was named after the Irish song "I'll Take You Home Again Kathleen," which my dad sang to me quite often growing up. That's about it. The lovely story of how I got my name. My dad was an Irishman who loved his Irish songs and that is really all there was to it. My sister is named Colleen, which is also Irish and he was in charge of picking her name too. Guess my mom should have voted to pick the girl names instead. Just in case you're curious, I would have been Joshua David if I was a boy. I love your name. I have no idea how my parents decided on my name. I know my dad wanted to name me Dixie Lee, but mom wasn't having that. That is so sweet about your Dad singing that song!! What a great memory! I love the name Kathleen - beautiful! My dad named me as well. My mom wanted to name my Harmony. So yeah, thank you to my dad for helping me dodge that bullet! So sweet that your dad sang you your song! It's a beautiful name! I love the story about how I got my name and the meaning behind it told by my late grandmother! I love your name and the story behind it! Kathleen is such a pretty name. I was supposed to be Jason. But that didn't work out, so they named me after a woman who did a children's television show my sister liked. It means "beloved". I think Kathleen is pretty and I couldn't imagine you being anything else! I adore your name ... I would have been Benjamin Paul! Such a fun story behind your name. Love your name! I am partial to K names. Swims in tar? LOL You seriously can't stand when people shorten your name? So if I call you Kath, Kathers, Kathleeney you'll hate me? Love your name! Not sure what my parents were thinking. Maybe, "Hey let's name her what 80% of baby girls are being named this year and laugh as there's at least 10 other ones in every social circle for the rest of her life!" I think my mom named me after some soap opera actress years ago. Not positive.